A surprise of fresh scents every month! Give a gift that is both beautiful and functional. This gives the opportunity to get a new bar at the beginning of each month. Every month a deliciously scented box appears in you mail box containing an amazing handmade vegan soap bar. 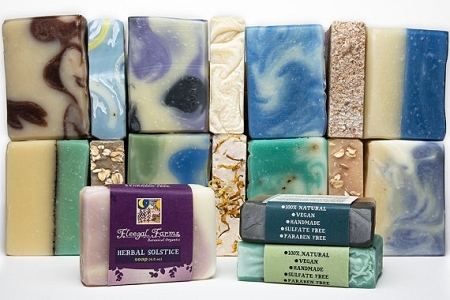 My soaps are true artisan creations made in small batches with filtered rainwater and only natural and vegan ingredients. To create my bars I use the age old cold process technique. The lack of heating protects the naturally occurring nutrients in the botanical oils. It also preserves the therapeutic properties of my essential oil blends. My pure botanical ingredients are ethically sourced and organic whenever possible. Another thing that separates my soap from many others is the high percentage of olive oil, which creates a soothing silky lather and a substantially longer lasting bar than those made from lower quality oils. My proprietary formula yields a mild and moisturizing soap that is suitable for even the most sensitive skin. In addition, I take the extra time to hand bevel each side so your bar has perfectly smooth edges from the very first use. Every month will be a surprise with fresh scents in the spring, cool scents in the summer, and warmer scents in the fall and winter. Bars ship every month by the 7th. All bars are shipped first class or priority. Please specify if this is a gift so we can include a to and from note. Please include address of recipient if this is a Gift Soap of the month. Shipping Prices are included in listing price.